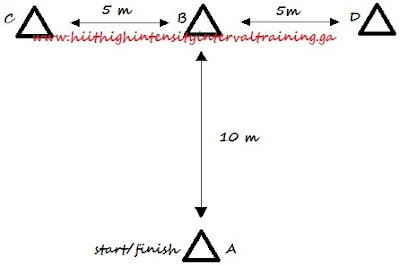 The objective of this test is to monitor the development of the athlete’s agility with directional change. 3 cones are set five metres apart on a straight line. A fourth cone is placed 10 metres from the middle cone so that the cones form a T.
The coach stops the watch and records the time.. Analysis of the result is by comparing it with the results of previous tests. It is expected that, with appropriate training between each test, the analysis would indicate an improvement in the athlete’s agility. This T-Test of Agility test is suitable for active athletes but not for individuals where the test would be contraindicated. There are no published tables to relate results to potential performance in competition.